Testing with Ravnica Allegiance has been fruitful. For the most part, the cards that looked good enough for Modern have been. A few cards have even exceeded expectations. Most of the time in Modern, it’s correct to only play the very best card for the job. Raw card power makes up for a variety of other problems and can pull back seemingly lost games. However, that’s not always the case. The right tool isn’t always a bigger hammer, and sometimes the “better” card is actually worse in many ways. This week, I’m revisiting some Allegiance cards that fall in this category. I didn’t even mention Deputy of Detention during preview season. Most of the reason was that almost everything I would have said had been said before I got around to it. The rest was that I didn’t actually think that there was much to say. It looked like another decent, though not great, utility creature in Chord of Calling toolboxes, probably replacing Fiend Hunter. Deputy seemed too weak compared to Reflector Mage to make it on its own merits. Mage is such an insane card that it seemed like a no-brainer. The tempo swing is enormous and devastating in many matchups. Being unable to replay the creature for a full turn is often lethal in race situations, and a 2/3 is decent on both offense and defense. Being a Human just supercharges its power and playability. Meanwhile, Deputy is a smaller 1/3, and if it leaves the battlefield the permanent is returned without need to spend additional mana or time. It also has less-useful and synergistic creature types. Deputy can hit any nonland permanent and its siblings, but it dies to everything that kills Reflector Mage. If that happens before the ability has resolved, then nothing happens and you’ve wasted mana, unlike with Mage. The catch is that in a lot of matchups, Mage is just a 2/3 for three. Sometimes it’s arguably worse than that because the all the creatures have enters-the-battlefield abilities and bouncing them is doing the opponent a favor. And it will return to play baring intervention. This means that if that tempo swing isn’t enough, playing Mage might be self-defeating. Also, rather facetiously, not every deck has creatures in the first place. There’s no guarantee that Deputy will be killed, and so the removed permanent may never return. That’s not really a good enough reason to beat out Mage. What is: how many noncreature permanents see play, and how many multiples are reliably in play. Taking dangerous artifacts, enchantments, and planeswalkers in addition to creatures means that Deputy has text beyond its stats in every matchup. Furthermore, Reflecting one Bloodghast or Arclight Phoenix while facing down several is pretty mediocre. The rest will swing freely and it’s not like either will stay in hand waiting to be recast in the first place. Using Deputy means they’re all gone for the life of the lawman. That’s significant. In straightforward creature matchups and race situations, Reflector Mage is superior thanks to its better stats, type line, and ability. However, the versatility of Deputy cannot be overlooked in this shifting format. 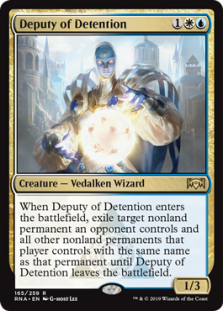 Outside of Humans, I now believe that Deputy of Detention is superior to Mage. I discussed Lavinia at length during Ravnica Allegiance previews. Basically, I thought that Lavinia wasn’t as good a sideboard card as Gaddock Teeg because her first ability was too soft and the second one too niche to see widespread play. I expected Lavinia to see play as a compliment to Spell Queller and as maindeck hate in combo heavy matchups. Testing has prompted me to revise my opinion. To be clear, in most situations, Teeg is still the harder answer. However, his main appeal was shutting down Ironworks, a deck that no longer exists, which lowers his stock. I also found through experience that Lavinia’s ability is much closer to Teeg’s against Tron and Miracles than expected. Neither decks reliably hits land drops five plus on time that often, and by then it’s frequently too late. There have also been occasions where Lavinia relevantly prevented Burn from spectacle-casting Skewer the Critics and/or Light Up the Stage. However, it was the second ability that really surprised me. It’s far more relevant than anticipated. Firstly, suspend spells are seeing more play with Electrodominance getting tested. Secondly, in my local metagame and on MTGO I’ve seen spikes in Amulet Titan, Living End, and Valakut decks. Lavinia counters Summoner’s Pact, Living End, and Search for Tomorrow, all of which are critically important to their respective decks. Answering suspended Search in particular has been crucial because RG Valakut decks of all stripes only have it and Sakura-Tribe Elder for independent ramp. This has left the real test being whether Lavinia can compete with Thalia, Guardian of Thraben. I’ve become confidant she can, not just in Spirits but throughout Modern. Stats- and versatility-wise, Lavinia is much worse than Thalia, but in context, she’s much better. Most of the time I’ve found Thalia to be Lightning Bolt fodder. I haven’t had a relevant Thalia in any deck survive more than one turn in any matchup in months. It’s been getting worse since the UR Phoenix decks started maindecking Gut Shot. Even when Thalia has survived, she hasn’t been that important. She’s outclassed by far too much these days, and the taxing isn’t making up the difference. Thalia has always been a just speed bump for spell-dependent decks; the question is how easily they get over the bump. Legacy is defined by cantrip dependence and low land counts. Slowing down the velocity and requiring extra mana is frequently insurmountable. None of that is true in Modern, and thus it’s easier to overcome the tax. Even against Phoenix decks where Thalia should be good, Thing in the Ice answers her by brickwalling the clock until it can Awaken, remove the tax, and unleash the deck. Thalia hits everything, but not well. Meanwhile, Lavinia is technically worse. In most matchups she’s just a 2/2 bear and not really worth killing. She’ll never win at combat, so why worry about an otherwise textless card? I’ve gotten more damage through with Lavinia than Thalia in comparable situations, but that’s not enough reason to play a card. The real reason is impact magnitude. Thalia has a marginal effect against almost everything. Lavinia only hits a few decks, but she hits them hard. I underestimated just how massive an effect Lavinia could have in the right matchups and how widespread they were becoming. Removing Krark-Clan Ironworks has reopened the space for combo decks, and suddenly Lavinia has more targets. Amulet Titan loses its tutoring engine, arguably the heart of the deck. Storm cannot go off turn three under Lavinia because Gifts Ungiven and Past in Flames are uncastable. Living End is similarly bricked. What Lavinia does is demand an answer from affected decks, where Thalia just asks a question. As a result, I’ve come to believe that Lavinia has a place in Modern independent of Spell Queller or other support cards. I don’t think she’ll ever see the widespread play of Thalia (partially due to color requirements and partially her more limited usage), but the play she does see will be devastating. I have been playing her in UW Spirits to good effect alongside Queller, but if Tron or combo decks become more prevalent, I expect more decks will pick up Lavinia. If you’re a Spirits player heading to Toronto this weekend, I highly recommend maindecking Deputy whether you’re playing UW or Bant. In a format where prison players are beginning to emerge from the woodwork again, maindeck answers to Ensnaring Bridge are vital. I’ve also seen more UR Phoenix players adopting Pyromancer Ascension, and having an answer or at least a way to reset the enchantment is quite good. Deputy also frees up sideboard slots that would have gone to general answers like Disenchant. I had both the Lavinias maindeck for awhile, but Tron has drastically fallen off locally, so I switched the second out for another Deputy. If Tron comes back in force, I would replace Kira with the second Lavinia. My next card has actually met my expectations, but the decks it goes in do not. Growth Spiral is on track to have a huge impact on Standard, but Modern is another story. In my preview, I predicted that it wouldn’t see widespread play because it simply didn’t belong in currently existing decks. It would take a very specific deck filled with instants for Spiral to be useful. It appears that I’m not alone in this belief and that it’s correct so far, because the only deck I could find using Spiral was from the recent Modern 5-0 listings. I wonder why this deck has a 14 card sideboard. I thought that it would be strict Temur Scapeshift that would play Spiral, but I also frequently forget that Bring to Light exists. This deck, with its abundance of lands and instants, is a natural home for Spiral and showcases how the card should be used. However, one result is not a great showing for the Spiral. It’s a little disappointing for such a promising card, but I’m not too surprised. There may be a lot to recommend about Spiral eligible decks, particularly additional flexibility and interaction, but it’s currently not enough to justify their more complex natures. The simpler Titanshift is going to win more. There are a number of players at my LGS who are trying to make Temur Scapeshift work and not getting anywhere. One played it back in Splinter Twin days, and one is an eternally optimistic brewer; they’re approaching the deck from very different angles. The former dreams of combo-control, while the latter has swung between pure combo and tempo-combo. Spiral is a good card in both decks and arguably the glue that holds them together. However, neither have won with any version of the deck so far. The problems vary, but the underlying one is speed. Not necessarily their decks’ speed, but their opponents’. Twin aside, Modern was slower in 2015 because the fast decks of today weren’t viable. The Fundamental Turn has decreased, and it’s proving hard for Temurshift to keep up. Bolt-Snap-Bolt is powerful removal, but not as much as it used to be. Thus playing one land a turn with one or two extra just isn’t enough to kill fast enough. This requires them to reprioritize constantly and it’s not working. The deck is getting strained in too many directions to be coherent and successful. This leads into the larger problem for the hopeful brewers because in the same time period the normal GR Titanshift pilots have done very well. This begs the thus-far unanswered question: why bother with the counters and Spiral? Titanshift has more ramp, so it kills faster and doesn’t have to worry as much about opposing decks. This proactiveness makes it a more coherent strategy. The other problem is that Titanshift rarely has to worry about failing to kill with Scapeshift. Most of Titanshift’s lands are mountains of one form or another, so it shouldn’t have to worry about fetching too many. The multi-colored Valakut decks usually run just enough mountains so if they don’t have Prismatic Omen and/or the game runs long, they can draw too many and the kill will fail. This has been a problem for my brewers. So far, Titan keeps being so much better a deck than Temur, despite its one-sidedness, that the additional interaction isn’t worthwhile. Modern is showing quite a bit of adaptation and development from Ravnica Allegiance. I’m sure there’s a lot more still in the brewing labs and I hope to see it at the GP level soon. Until then, don’t be discouraged, and keep testing. I have played Blue Shift for years and years, and I’m currently unexcited by Growth Spiral in BtL Scapeshift because of the manabase. The list you show circumvents that by playing a whopping 4x Prismatic Omen as a color fixer, but it also doesn’t play 4x Valakut to actually make that a worthwhile investment. I was expecting to see it in the GateShift lists that were seeing a decent amount of play online earlier. Their mana is cleaner, so you can cut other ramp spells and not worry about fixing as much. I’m currently going to be testing it in RUG TitanShift (my first Modern deck) as a light blue package, like my original list did. 4x Izzet Charm 4x Remand 4x Growth Spiral is the entire blue package. My original list was on 4x Valakut 4x Prismatic Omen but i’m not on that at the moment. Izzet Charm is going over Bolts, Spiral over random ramp spells (Farseek/Explore), and Remand over the Summoner’s Pacts and other ramp spells. The blue should add enough dig that cutting the 2 Summoner’s Pacts (down to 8 payoffs) should still be fine. My OG list ran 4x Serum Visions and 2x Halimar Depths as well, but that doesn’t seem correct here. I’m on 2 Relic of Progenitus, 2 Anger of the Gods, 1 Hour of Devastation in my random flex slots. I’m not sold on Relic at the moment. Opening up the sideboard to counterspells like Dispel/Negate is nice. List here: https://deckbox.org/sets/2245867 I should be playing it at FNM this Friday if nothing comes up. Any thoughts on the recent 5-0s by Merfolk employing Benthic Biomancer (Ben)? It’s a fine card. If there’s an efficient and synergistic means to keep adding counters so it keeps looting, it may be a great card. Merfolk’s problem is that Spirits and Humans are doing basically the same thing but with better disruption. Biomancer is making the case for Merfolk to be the grindy variant, and while I don’t think it fully does so, it’s a move in the right direction. I hope we get another good one soon. On the scape shift note blue always seemed unnecessary in a deck that’s already one of the most consistent decks in all of modern.